Ecology and technology have combined to give nature a helping hand, using a robot to deliver heat-tolerant coral larvae directly onto the Great Barrier Reef, in the first small scale pilot of a new technique to help restore and recover coral reefs. In a world first, an undersea robot has dispersed microscopic baby corals (coral larvae) to help scientists working to repopulate parts of the Great Barrier Reef during this year’s mass coral spawning event. Six weeks after winning the Great Barrier Reef Foundation’s $300,000 Out of the Blue Box Reef Innovation Challenge, Southern Cross University’s Professor Peter Harrison and QUT’s Professor Matthew Dunbabin trialled the ground-breaking initiative on Vlasoff Reef, near Cairns in north Queensland. Professor Dunbabin engineered QUT’s reef protector RangerBot into LarvalBot specifically for the coral restoration project led by Professor Harrison. The project builds on Professor Harrison’s successful larval reseeding technique piloted on the southern Great Barrier Reef in 2016 and 2017 in collaboration with the Great Barrier Reef Foundation, the Great Barrier Reef Marine Park Authority (GBRMPA) and Queensland Parks & Wildlife Service (QPWS), following successful small scale trials in the Philippines funded by the Australian Centre for International Agricultural Research. “This year represents a big step up for our larval restoration research and the first time we’ve been able to capture coral spawn on a bigger scale using large floating spawn catchers then rearing them into tiny coral larvae in our specially constructed larval pools and settling them on damaged reef areas,” Professor Harrison said. “Winning the GBRF’s Reef Innovation Challenge meant that we could increase the scale of the work planned for this year using mega-sized spawn catchers and fast track an initial trial of LarvalBot as a novel method of dispersing the coral larvae out on to the Reef. “With further research and refinement, this technique has enormous potential to operate across large areas of reef and multiple sites in a way that hasn’t previously been possible. This research and the larval production process was also directly supported by the recent successful SBIR 2018 Coral larval restoration research project on Vlasoff Reef led by Professor Harrison with Katie Chartrand (James Cook University) and Associate Professor David Suggett (University of Technology Sydney), in collaboration with Aroona Boat Charters, the GBRMPA and QPWS. With a current capacity to carry around 100,000 coral larvae per mission and plans to scale up to millions of larvae, the robot gently releases the larvae onto damaged reef areas allowing it to settle and over time develop into coral polyps or baby corals. Professor Dunbabin said LarvalBot could be compared to ‘an underwater crop duster’ operating very safely to ensure existing coral wasn’t disturbed. “During this year’s trial, the robot was tethered so it could be monitored precisely but future missions will see it operate alone and on a much larger scale,” Professor Dunbabin said. “Using an iPad to program the mission, a signal is sent to deliver the larvae and it is gently pushed out by LarvalBot. It’s like spreading fertiliser on your lawn. “The robot is very smart, and as it glides along we target where the larvae need to be distributed so new colonies can form and new coral communities can develop. This project builds on the work by Professor Dunbabin who developed RangerBot to help control the coral-killing crown-of-thorns starfish which is responsible for 40 per cent of the reef’s decline in coral cover. Great Barrier Reef Foundation Managing Director Anna Marsden said, “It’s exciting to see this project progress from concept to implementation in a matter of weeks, not years. The recent IPCC report highlights that we have a very short window in which to act for the long term future of the Reef, underscoring the importance of seeking every opportunity to give our reefs a fighting chance. 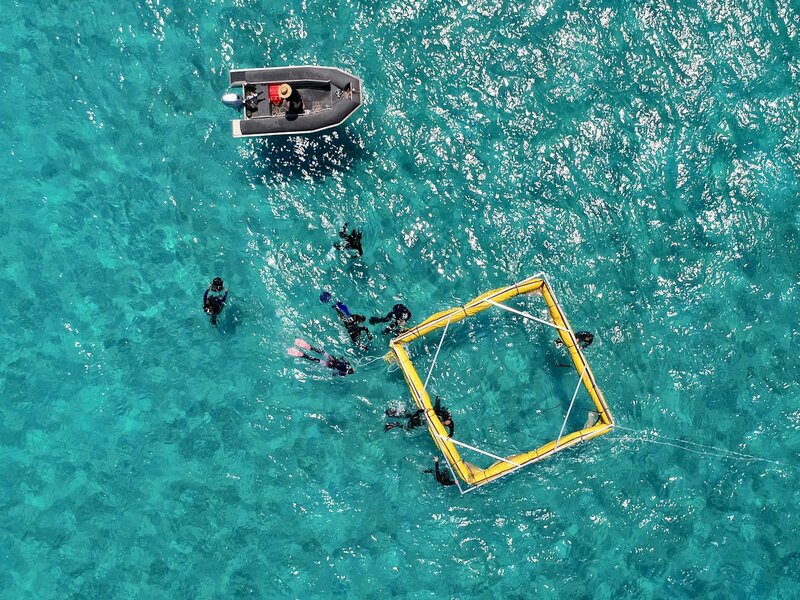 Following the success of this initial trial in 2018, the researchers plan to fully implement their challenge-winning proposal in 2019, building even larger mega spawn-catchers and solar powered floating larval incubation pools designed to rear hundreds of millions of genetically diverse, heat-tolerant coral larvae to be settled on damaged reefs through a combination of larval clouds and LarvalBots. NOTE: The 2018 Larval Restoration Project (an Advance Queensland Small Business Innovation Research initiative funded by the Queensland and Australian Governments) is a large scale collaboration involving researchers Peter Harrison (Southern Cross University), Katie Chartrand (James Cook University) and David Suggett (University of Technology Sydney), the Great Barrier Reef Marine Park Authority, Queensland Parks & Wildlife Service, Aroona Boat Charters, Argo Expeditions, Biopixel, Reef Magic, Citizens of the Great Barrier Reef, Yirrganydji Land and Sea Rangers, Gunggandji Land and Sea Rangers, Cairns Marine, QUT and the Great Barrier Reef Foundation.